Department functionality allows you to separate GoCanvas Apps, Submission data, and users inside a single GoCanvas account. This is typically for larger organizations that need to manage lots of GoCanvas Apps and users. For example, if you have a Sales team at your company, a Service team, and a Quality team then you can create a Department for each inside GoCanvas. Departments allow you to structure GoCanvas just like your organization so everyone only has access to what they should have access to. GoCanvas Apps - Each Department can have their own GoCanvas Apps that only they can have access to. However, a GoCanvas App created by one Department can be shared with another Department, too. Only the Department that created and shared the GoCanvas App has the ability to edit it. Submission Data - Each Department can only access Submission data for GoCanvas Apps within their own Department. GoCanvas Users - Your users can have access to more than one Department. And they can also have different roles (access privileges) within those Departments. For example, you could give your employee an "Admin" role in one Department and a "User" role in another. 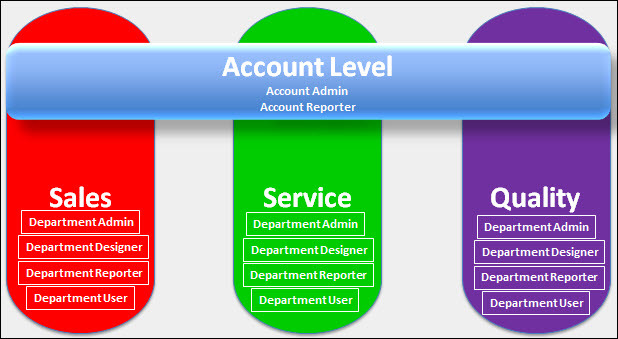 Learn more about the different roles available when Department functionality is enabled. Groups - Each Department can have their own Groups to organize their users and assigned GoCanvas Apps. Reference Data - Each Department can manage their own Reference Data for the GoCanvas Apps that they build and manage. Reference Images - Each Department can manage their own Reference Images for the GoCanvas Apps that they build and manage. Department functionality allows organizations to give their teams the freedom to create the GoCanvas Apps they need without other teams being able to edit them or view their Submissions. Instead of everyone having access to everything, now each team can have a streamlined view of GoCanvas when logging into the GoCanvas website. Learn how to configure Departments with this help topic.